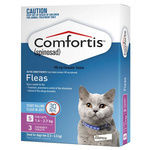 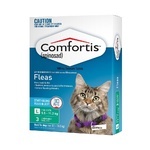 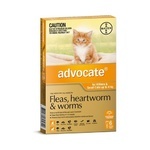 Drontal Allwormer for cats and kittens protects your pet against every type of intestinal worm commonly found in Australian cats, including roundworms, hookworms and tapeworms. 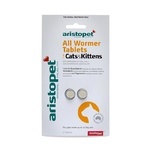 Drontal Allwormer for cats and kittens now comes in a new ellipsoid shape, designed for easier treatment of cats. 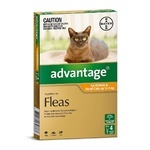 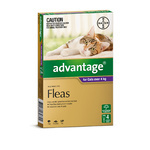 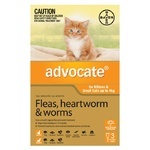 The fast acting cat worming tablets also provide peace of mind by helping to protect families against transmissible worm infections that can be harmful to humans. 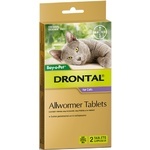 Gentle and effective, Drontal Allwormer tablets are suitable for cats of all ages, whether they are young kittens or pregnant queens.They can be combined with other parasite protection products such as Advantage for Cats (for protection against fleas).